Townhouse condo in heart of Destin. Private beach. Umbrella/chair setup. -Two story townhome - drive up to front door - no highrise elevator hassle! -Beach chairs/umbrellas available for rent at our private beach. -Pool is typically heated the weeks of Thanksgiving and Christmas. Also heated from March thru Spring Break, around Mid-April. - Single persons under the age of 25 must be accompanied by parents or guardian during stay. -No pets, no smoking. Pet and smoke free. -Check-in after 4 PM. Check-out before 10 AM. Very quite and private. Close to pool and tennis courts. Drive up and park at front door. Townhouse condo ... no elevators to deal with. Short walk to Beautiful white-sandy beach (200 yards). 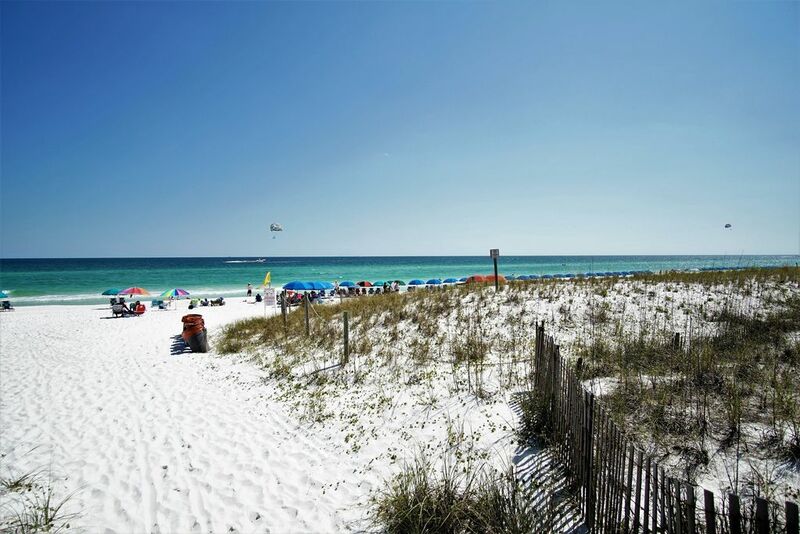 Heart of Destin - convenient to new Harbor Walk restaurants, Wal-Mart, Target, WalGreens, Wynn-Dixie, Publix, Home Depot Five acre fresh water lake on property stocked with bass and brim (catch and release fishing). Master bedroom has a private bath. Bedrooms #2 and #3 share a bath. 200 yard walk to beach. Main table seats 6. Small table located in living area with two bar stools. Short walk to pool on way to beach. Also kiddie pool. Heated in winter. Beach access (200 yard walk on property, past tennis courts and pool). Located on beach side of lake. The condo was very clean and in a great location. The size of the condo and the table was great for our group of six. The kitchen was very nice and had everything that we needed. Access to the beach was not very far at all and we enjoyed our time there. The only negative was that the dryer took a very long time to dry. We have stayed in Southbay condos several times over the years. Condo #79 owned by Patrick was one of the best. He provided very clear cut instructions for checking in and out. The condo was clean, roomy, and included all the necessary items to make our stay enjoyable. We will definitely recommend it to others. Very relaxing and enjoyable! Right near the beach and plenty to do within walking distance to the strip mall and dining. Will definitely be returning. Great place at a great price. Beds and pillows were very comfortable and the kitchen was well stocked. Waffle iron, griddle, blender, toaster, microwave, and coffee maker. Also, tons of bowls & serving pieces, lots of utensils, and left behind spices. Unit was clean, roomy, and a quick walk to beach. Bedrooms are all upstairs, and both secondary bedrooms offer a slim view of Gulf if you peek out the window at a certain angle. Wi-fi seemed to be able to handle all our devices, nice cable package + YouTube access. Wish the weather had been warmer, but that is what you get in the shoulder season. This is a great value for the dollar. You are steps away from the beach! We had a issue with the heat and Patrick was immediately on it and had a repair person at the door by the am. He was great to communicate with and we definitely will be a repeat customer! We had a great time there. The townhouse was perfect. We had everything we needed and close to the beach. Big Kahuna water theme park across highway. Fishing in five acre lake on property, Harbor Walk Village (2 miles) - Fishing fleet, restaurants, shopping, zip line. $250 deposit refunded 7-10 days after departure and no report of damage by housekeeper.